I have been working for a large marketing company for about 9 months in planning. This is made up of about 12 senior planners each responsible on a project to project basis and managing single projects. The department is being broken up into client teams. There will be 5 project teams each headed by 1 senior planner and staffed by one junior or two very juniors. That leaves 7 left over who are getting the boot right out the door with immediate effect. The company is making out like it is performance related except it couldn’t be further from the truth. The client managers are picking their favorites. The favorites are the least skilled and experienced and tend to let the client managers walk all over them. I am slightly different as I do support strategy and am a shared resource. So I need to go to the creative team. The creative team don’t want me! My ex-line manager said it is because they are creative into skateboarding and you are over 40 and your face doesn’t fit. Now my job is on the line with immediate effect. My performance review which was good has been withdrawn! The powers that be are now interviewing everyone I have worked with and asking them to find fault with me with leading questions like “do you think she could still improve”, could she have done better? Any day now I expect a tap on the shoulder to be told I need to hand in the password to my computer and leave the building. Seriously this is what is happening to everyone else. But to your question… what can you do? Outside of the legal aspects, I would recommend some objective self-assessment and analysis. One of the first questions is why you are not among the favorites. Well, for starters, you appear to have a back-bone (being a vertebrate is always a good thing) when it comes to dealing with client managers. It stinks to be the one left out, but that is sometimes how life happens. The reason I bring up self-assessment is that you most likely will be headed to a new job and a new employer soon. That’s not necessarily a bad thing, given how you’ve been treated. You will want to think about how you want to be perceived and viewed (and ultimately valued) in your next position. Marketing is a fickle sport… especially when it is ourselves that we’re marketing. Overly modest people tend to get short-changed and cheated because they don’t know how to sell themselves effectively to the people who make decisions. In your case (whether accurately or perceivably), you weren’t viewed as a project manager with whom client managers wanted to work, and you weren’t perceived as creative and innovative enough for the Creative Team. It’s up to you to fix that. If you want to be perceived as a project manager, act like a project manager (including working with stakeholders and communicating and building relationships). If you want to be viewed as a creative resource, act like a creative resource. Bring fresh ideas to the table. Be a little random. Have a midlife crisis (within respectable boundaries, if you have a spouse). In short, we often abdicate others’ perceptions of us to them, instead of attempting to own and manage those perceptions. It can be challenging, but it is a skill that every professional needs to master. How you communicate your accomplishments in these arenas will also affect how people perceive you. If you spend all of your time bragging about them, it can backfire. If you can go in and, through your accomplishments, build a fan base who will do your bragging for you, all the better. Good luck and thank you for writing to Office Politics. 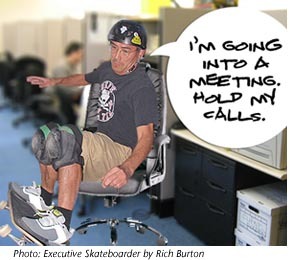 In Portland, Oregon we have a sizeable community of older skaters – that’s me in the office chair. I’m one of the oldest at 46. A lot of us are professionals with families. Some of us are even creatives. I sympathize with anyone who is treated unfairly, I just found it ironic that our once embattled ethnic group (skateboarders) is now in a position to discriminate. I find it funny, too. “Being young” is a pretty sad requirement, not to say pretty stupid. Associating it with skateboarding is even more sad and stupid. We have a community of old skateboarders where the norm is to be over 40, some are over 50, a few over 60. I feel like I’m a living oxymoron, now!